Fr. 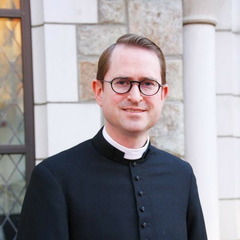 Humphrey began his ministry at St. Paul's as curate on October 15, 2005, and was made parochial vicar on June 1, 2010, in which capacity he also serves as the parish's Scholar-in-Residence. He served as priest-in-charge for six months during Fr. Andrew Sloane's sabbatical in 2011, and has assumed this position again as of Fr. Sloane's retirement on January 27, 2013. He previously served as curate at Saint James Parish and Academy, Monkton, Maryland, and taught in their day school. Before his ordination, he served as chaplain and religion teacher at Washington Episcopal School in Bethesda, Maryland. He grew up in Southern California and came to Maryland in the early 1990s to attend St. John’s College in Annapolis. While in college, Fr. Humphrey attended St. Anne’s, the church in Church Circle, Annapolis, but was directed to our parish to make his first confession. He attended Yale Divinity School. He has been married since 2004 to Anne Stone; they have two young children, a girl and a boy.